On-demand ride services such as Uber and Lyft have been widely welcomed by users for offering readily-available, reliable and comfortable service at an affordable price. Customer surveys have shown four in five users to be extremely or very satisfied, enviable satisfaction levels for any transportation service. App-based services are prospectively good for cities as a whole as well as customers individually. In providing an alternative to the personal auto, they can complement public transportation, reduce parking demands and drinking-and-driving, and improve access to myriad urban attractions from restaurants to cultural and entertainment venues. As their rapid growth added tens of thousands of vehicles to city streets, concerns about these "Transportation Network Companies" (TNCs) extended to impacts on traffic congestion and potentially undermining public transit and taxi services that are essential components of urban transportation networks. There has also been much discussion about how these types of services may integrate self-driving vehicles into their fleets and implications of this revolutionary technology on urban transportation ecosystems. The reports listed below explore the cross-cutting issues that lie at the intersection of app-based ride services, traffic, transit and the future of urban transportation networks. The reports discuss how TNCs can contribute to the goals of public transit agencies, document TNC impacts on traffic and transit, analyze regulatory issues and address the path toward self-driving vehicles operating as shared taxi- and transit-like services. 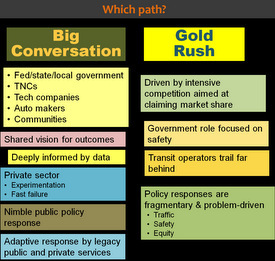 Municipal and civic officials in cities across the country are grappling with how to respond to the unexpected arrival and rapid growth of new mobility services, most notably, ride services such as Uber and Lyft (also called Transportation Network Companies, or TNCs) and “microtransit” companies such as Via and Chariot. Are these new mobility options friendly to city goals for mobility, safety, equity and environmental sustainability? What risks do they pose for clogging traffic or poaching riders from transit? What will happen when self-driving vehicles are added to ride-hail fleets? This report combines recently published research and newly available data from a national travel survey and other sources to create the first detailed profile of TNC ridership, users and usage. The rise of app-based ride services such as Uber and Lyft in major U.S. cities raises the question of what should be done to control the traffic impacts from their rapid growth without compromising the mobility benefits they bring to city residents. Amidst debate over congestion pricing recommendations made by a task force appointed by Gov. Andrew Cuomo, this report assesses how charges on taxis, app-based ride services and other for-hire drivers can respond to the serious challenges posed by the rapid growth of these new services. The report recommends that taxi/for-hire trips be charged an hourly fee that would apply to vacant time between trips as well as time with passengers. An hourly fee would incentivize companies to minimize vacant time which serves no mobility purpose and would encourage patrons to choose shared ride options or more efficient transit, walking and biking alternatives. 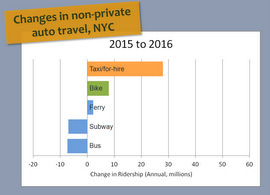 The report examines the sources of this growth and recommends steps to reduce the impact of TNCs on Manhattan traffic congestion as part of an overall program that would include a per-trip fee paid by taxi and TNC passengers and cordon-based congestion pricing fees paid by all drivers in the CBD. Over the last four years, Uber, Lyft and other app-based ride services have put 50,000 vehicles on the streets of New York City. Customers embraced these new services as offering a prompt, reliable and affordable option for traveling around town. Their growth also raises questions about their impact on traffic congestion and on public transit and taxi services that are essential components of urban transportation networks. A dearth of factual information has made it difficult, however, to assess their role in the city's transportation network or decide whether a public policy is needed. This report presents a detailed analysis of the growth of app-based ride services in New York City, their impacts on traffic, travel patterns and vehicle mileage, and implications for achieving critical City goals for mobility, economic growth and environmental sustainability in New York and other major cities. With big-state legislatures stymied over how to regulation Uber and Lyft, this report summarizes the debate on each of five key issues, assesses the arguments put forth by the various stakeholders, and makes recommendations designed to achieve core public policy goals of service, safety, competition and equity, while fairly balancing competing interests of companies, drivers, customers and cities themselves. This report outlines how government agencies can more effectively incorporate popular on-demand services like Uber and bikesharing to improve service for transit customers while also addressing some of the transit industries' biggest challenges. The report highlights strategies agencies can use right now to work with emerging mobility providers like ZipCar, Car2Go, bikeshare providers, and on-demand transit providers like Bridj or Via. This report was prepared for the Transit Center, a foundation dedicated to improving urban mobility. Bruce Schaller is a co-author of the report. 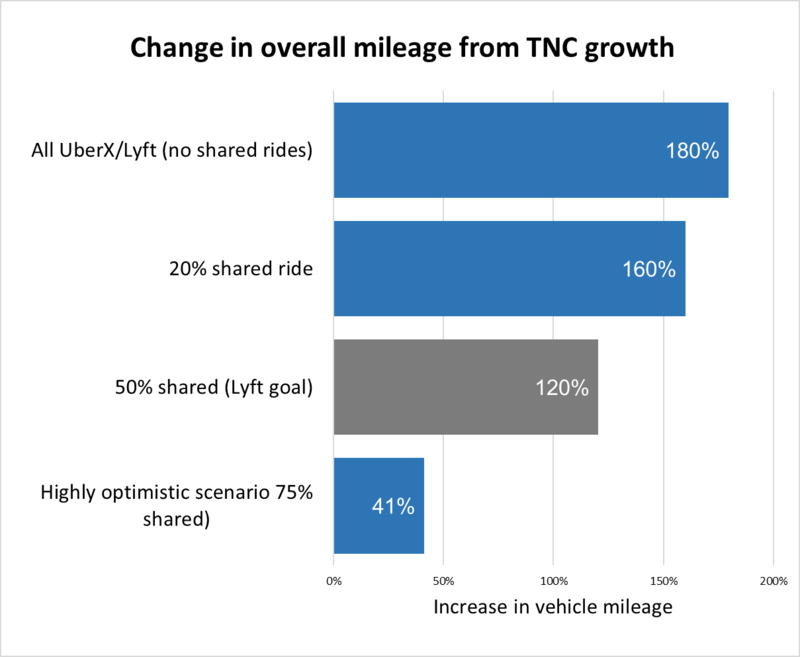 A report from the Transportation Research Board (TRB), the largest unit of the National Academies of Sciences, Engineering and Medicine, discusses in detail regulatory and policy issues raised by the rapid growth of Transportation Network Companies (TNCs) such as Uber and Lyft and other innovative shared mobility services including carsharing, bikesharing and microtransit. The report offers guidance to local and state elected officials and regulators on these rapidly evolving and complex issues. Bruce Schaller was a member of the TRB committee and co-wrote the report. 12-minute video interview by Rosalie Genevro, Executive Director of the Architectural League of New York, for the League's conference on Ground Transportation and Climate Change, held November 3, 2018. In this video, nationally recognized mobility expert Bruce Schaller offers an in-depth look at the forces shaping New York City’s transportation system. The interview was recorded as part of The Architectural League's Five Thousand Pound Life’s transportation series. "Cities should make transit the most attractive way to get around town, reallocate street space to support higher-capacity modes, and charge all vehicles for their contribution to emissions, congestion, and use of curbs. "In a place like Midtown Manhattan, where vehicle speeds average 5 mph during the business day, yellow cabs, Ubers and Lyfts are 50 to 80 percent of traffic flow and rapidly adding to congestion. Given these facts, it would be foolish to dismiss the notion of pressing the pause button on the spiraling growth of ride service vehicles. "But circumstances are different in other big cities where ride services are most concentrated in nightlife districts, such as Chicago’s Near North Side and D.C.’s Dupont Circle. It makes sense to manage rather than limit ride services with steps like directing drivers to pick-up and drop-off zones and cordoning off lanes for buses to speed down busy corridors." New York Daily News op-ed, July 2018. 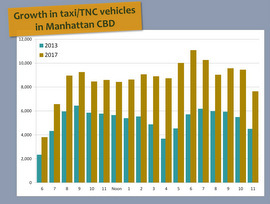 "The numbers from my most recent research show what is also visible to the naked eye: Ride-hail and yellow cab drivers now dominate the Manhattan streetscape. Put the cap where it counts: on Manhattan’s clogged streets. Limit the number of Lyfts and Ubers in Manhattan during daytime hours. That would force the companies to fill their cars and even yellow cabs." This article was published in a special issue of TR News, a publication of the Transportation Research Board, devoted to the 40th anniversary of deregulation. 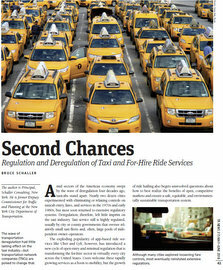 While airline, trucking, railroad and intercity bus industries underwent deregulation of entry and prices four decades ago, the for-hire (taxi and now TNC) sector was on a different timeline: deregulation in selected cities in the 1970s and '80s, followed soon after by re-regulation, and then the current, de factor deregulation in the form of "transportation network companies." This article examines this cycle and looks to the future of under shared service models and autonomous technology. Did you know that Uber and Lyft drivers spend one-third of their time in Midtown Manhattan empty searching and waiting for fares? How does this affect congestion and what can be done to have our taxi system run more efficiently? An Uber and Lyft Revolution? As tech firms and auto makers begin to test and look toward introducing fully autonomous vehicles, transportation, environmental and energy leaders are eagerly anticipating the replacement of private autos with systems of shared autonomous vehicles. A system of shared autonomous vehicles (SAVs) holds the promise of saving lives, eliminating traffic congestion, increasing mobility, and reducing space devoted to parking in central cities.